While the children of earlier generations have been given the benefits of outdoor play, free playtime has been shrinking for children of today as an increasing number of kids are now going online at a much younger age. Computer games have become the most convenient form of entertainment for most children. The massive proliferation of gadget use provides kids with hours of non-stop fun and this gives parents more time in their hands to do tasks without much interruption. While it is true that gadget play can teach children in many ways, spending most of their time in front of the computer or holding a gadget in their hand wherever they go is not the kind of play that will provide long-term benefits. Outdoor play still remains to be the best option for kids' physical fitness and not sitting on hours end playing gadgets. It is through active sensory play when all their five senses are awakened to discover and learn the world around them. This has been proven by Johnson’s baby in a social experiment to see how children respond to gadget play versus real play. Captured in a heartwarming film, this initiative has unveiled the wonders of learning using the five senses through active play. Child development experts say that learning opportunities abound in the playground. Parents should not underestimate child's play. When children are having a leisure time playing house, dress-up or organizing a game of hopscotch, they are actually developing crucial life skills. Those who are able to play in their own way are able to increase their ability to deal with stress and practice complex social and negotiation skills. Play allows children to make their own decisions, use their own initiative and feel good about themselves. This in turn help them to develop positive self-esteem and prepare their brains for the challenges of adulthood. Kids need to play to learn. Great play moments for growing kids is something money cannot buy. Playing outdoors is a form of exercise that promotes well-being and wholesome physical development. In school, sensorial activities are used to teach children about different concepts. Encouraging them to play and explore with blocks allow children to distinguish shapes, sizes and weight; it also encourages them to plan strategically. Providing opportunities to paint with different implements or with their body develops creativity and teaches them about colors and textures. Running, jumping, crawling or any form of movement can help them develop gross motor skills. Pretend play in these areas encourages communication among them. “Sensory activities allow children to go through a scientific process in a very natural way. While playing, they ask questions, predict, make hypothesis, test hypothesis and make conclusions,” shares Monica Javier, a pre-school teacher. For mom Kris De Guzman, a mother of two, introducing sensory play to her children balances out their time from other forms of play. It also makes them more imaginative, creative, and resourceful in the activities that they do together. “At home, bath time is also playtime for my kids. We play with bubbles, make up stories, and learn about body parts. Through simple activities like this, we are able to make enjoyable moments together and strengthen our connection toward each other”. 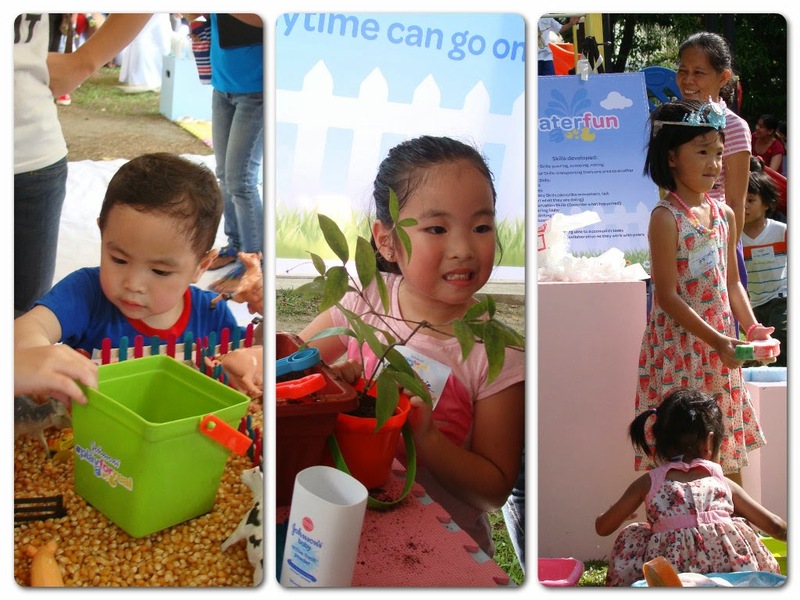 Indeed, playtime can mean so much more, so break out the tinker toys and let your kids #playforreal.